On Tuesday, March 26th, 2019, a gathering of New York’s most promising talent made their way to Red Hook, Brooklyn for a celebration of Lacoste’s latest partnership with American artist, Keith Haring. Jordun Love attends The Lacoste x Keith Haring Global Launch Party at Pioneer Works on Tuesday, March 26th, 2019. Photographed by Neil Rasmus/BFA. G-Eazy attends The Lacoste x Keith Haring Global Launch Party at Pioneer Works on Tuesday, March 26th, 2019. Photographed by Neil Rasmus/BFA. 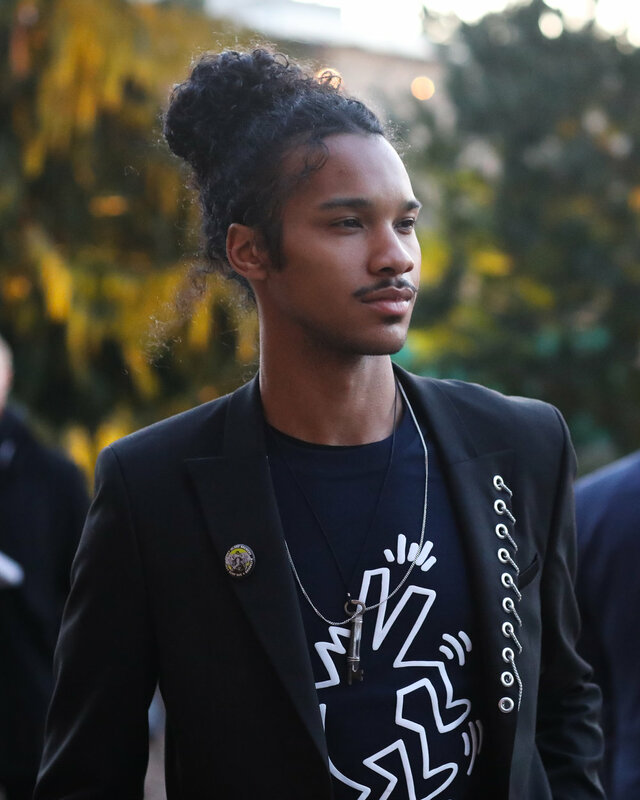 Loic Mabanza attends The Lacoste x Keith Haring Global Launch Party at Pioneer Works on Tuesday, March 26th, 2019. Photographed by Neil Rasmus/BFA. Jordan Stenmark attends The Lacoste x Keith Haring Global Launch Party at Pioneer Works on Tuesday, March 26th, 2019. Photographed by Neil Rasmus/BFA. Wellington Grant attends The Lacoste x Keith Haring Global Launch Party at Pioneer Works on Tuesday, March 26th, 2019. Photographed by Neil Rasmus/BFA. Thierry Guibert at The Lacoste x Keith Haring Global Launch Party at Pioneer Works on Tuesday, March 26th, 2019. Photographed by Neil Rasmus/BFA. Guests attend The Lacoste x Keith Haring Global Launch Party at Pioneer Works on Tuesday, March 26th, 2019. Photographed by Neil Rasmus/BFA. Atandwa Kani attends The Lacoste x Keith Haring Global Launch Party at Pioneer Works on Tuesday, March 26th, 2019. Photographed by Neil Rasmus/BFA. Dustin Yellin attends The Lacoste x Keith Haring Global Launch Party at Pioneer Works on Tuesday, March 26th, 2019. Photographed by Neil Rasmus/BFA. CT Hedden attends The Lacoste x Keith Haring Global Launch Party at Pioneer Works on Tuesday, March 26th, 2019. Photographed by Neil Rasmus/BFA. Jim Moore attends The Lacoste x Keith Haring Global Launch Party at Pioneer Works on Tuesday, March 26th, 2019. Photographed by Max Lakner/BFA. Bram Valbracht attends The Lacoste x Keith Haring Global Launch Party at Pioneer Works on Tuesday, March 26th, 2019. Photographed by Max Lakner/BFA. A$AP Nast attends The Lacoste x Keith Haring Global Launch Party at Pioneer Works on Tuesday, March 26th, 2019. Photographed by Max Lakner/BFA. Talun Zeitoun attends The Lacoste x Keith Haring Global Launch Party at Pioneer Works on Tuesday, March 26th, 2019. Photographed by Max Lakner/BFA. From Left To Right: Keytt Lundqvist, and Alex Lundqvist attend The Lacoste x Keith Haring Global Launch Party at Pioneer Works on Tuesday, March 26th, 2019. Photographed by Max Lakner/BFA. Benito Skinner attends The Lacoste x Keith Haring Global Launch Party at Pioneer Works on Tuesday, March 26th, 2019. Photographed by Max Lakner/BFA. Moti Ankari attends The Lacoste x Keith Haring Global Launch Party at Pioneer Works on Tuesday, March 26th, 2019. Photographed by Max Lakner/BFA. 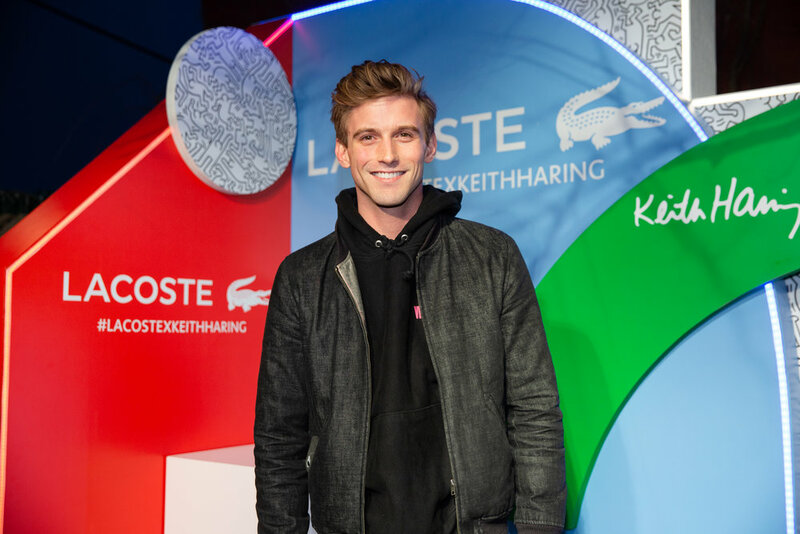 RJ King attends The Lacoste x Keith Haring Global Launch Party at Pioneer Works on Tuesday, March 26th, 2019. Photographed by Max Lakner/BFA. The Lacoste x Keith Haring Global Launch Party at Pioneer Works on Tuesday, March 26th, 2019. Photographed by Neil Rasmus/BFA. Quincy Brown attends The Lacoste x Keith Haring Global Launch Party at Pioneer Works on Tuesday, March 26th, 2019. Photographed by Neil Rasmus/BFA. 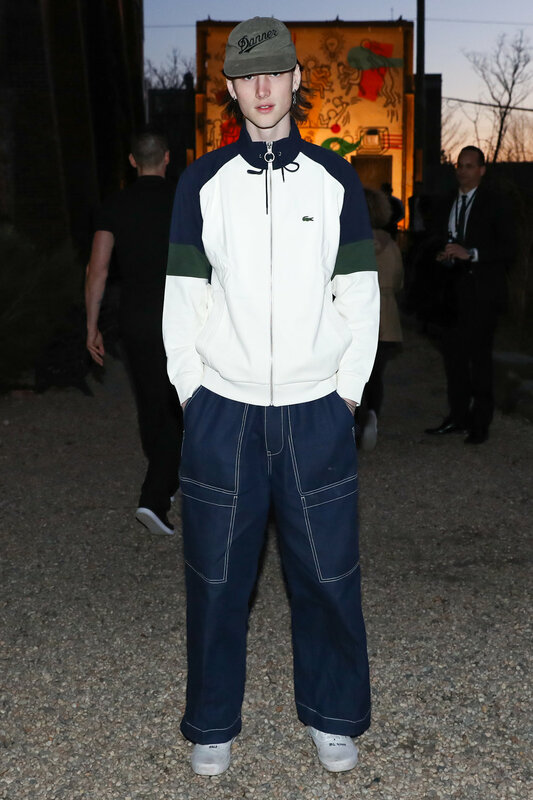 Timo Weiland attends The Lacoste x Keith Haring Global Launch Party at Pioneer Works on Tuesday, March 26th, 2019. Photographed by Neil Rasmus/BFA. Ryan Kelly and Enrico Bruni attend The Lacoste x Keith Haring Global Launch Party at Pioneer Works on Tuesday, March 26th, 2019. Photographed by Max Lakner/BFA. Salif Gueye performs at The Lacoste x Keith Haring Global Launch Party at Pioneer Works on Tuesday, March 26th, 2019. Photographed by Neil Rasmus/BFA. NEW YORK - On Tuesday, March 26th, 2019, a gathering of New York’s most promising talent made their way to Red Hook, Brooklyn for a celebration of Lacoste’s latest partnership with American artist, Keith Haring. The collaboration - made up of a new capsule collection, and a reinstallation of the Haring’s Boys Club Mural originally created in 1987 by Haring himself is exceptionally clever. For the rebirth of an art piece that hadn’t been exhibited publicly for over ten years, it was easy for guests to note an undeniable nostalgic nod to a true New York experience. Especially since it was located on venue grounds at Pioneer Works, where it will now be publicly showcased until May 12th. The mural, originally designed on the wall of the Pitt Street Boys’ Club on the Lower East Side back in 1987 signified a time where Haring used his graffiti approach to art to further the surroundings of traditional gallery settings. Themes of accessibility, and recreational activity for young people was intentionally attached to his work, and seeing the content thread aligns with what Lacoste continues to represent, the union is well founded. The artistic, and socially conscious capsule collection also recognizes his signature emblem. Getting into the festivities of the launch party after attendees were able to view the mural on their way in, the general consensus exhibited a high energy aura. Attendees enjoyed dainty hors d'oeuvres, salad bowls, and dessert as they relished in live performances by viral dancer, Salif Lasource and NYC Hit Squad. The soothed crowd, from Quincy Brown to G-Eazy to Jordun Love, were veritably having a great time, springing on from one friendly face to another.